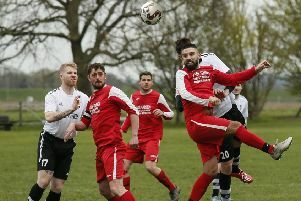 Bedford Town twice took the lead against Hanwell Town on Saturday but couldn’t hold on as the points were shared in their 2-2 Southern League Division One Central draw. The Eagles started well and moved ahead on eight minutes when Andrew Phillips converted from the penalty spot. The visitors were playing well though and their pressure told on 22 minutes when Lamar Simpson equalised. As half-time neared, Phillips grabbed his second goal, set up nicely by Lee Roache. After the break, Hanwell continued to press and were rewarded in the 62nd minute when Dave Allen’s effort from the edge of the area went across Eagles keeper Enol Ordonez-Suarez. Both sides then created chances to win it near the end, most notably when Roache was put through but for once he couldn’t convert. James Peters earned the star man honours as the draw leaves Town in eighth place with four games remaining. Next up is a tough test on the road this Saturday (3pm) against fifth-placed Marlow.